Social movements belonging to the Popular Brazilian Front (Frente Brasil Popular, FBP, in Portuguese) announced on Saturday that they will host a Brazilian People’s Congress next year, which aims to provide a political platform for ordinary Brazilians to articulate their demands leading up to the country’s Presidential elections in 2018. "We are going to hold a large forum where people will be able to discuss and debate the current situation that we are facing and those responsible for the current crisis," said João Pedro Stedile, coordinator of the Landless Workers Movement (Movimento dos Trabalhadores Rurais Sem Terra, MST, in Portuguese), in an interview with FBP. According to the FBP, for Brazil to transform into a "strong, independent, sovereign and developed nation", it will require the participation of the working class. The planned Brazilian People's Congress is considered unprecedented in its scope due to the diverse representation of grassroots organizations. The event will provide a chance for ordinary Brazilians to design and develop a political blueprint for inclusive development in Brazil. An additional but equally important objective of the Brazilian People’s Congress will be focused on mobilizing Brazilian society for the country’s upcoming 2018 presidential elections. "We are going to approve a united political project that will ensure that all of the 2018 political candidates commit to our broad but principled demands. Specifically, we will demand the restoration of democratic practices, along with the provision of inclusive development policies like public education, science and technology," said Nalu Faria, with the World’s Women’s March, in an interview with FBP. 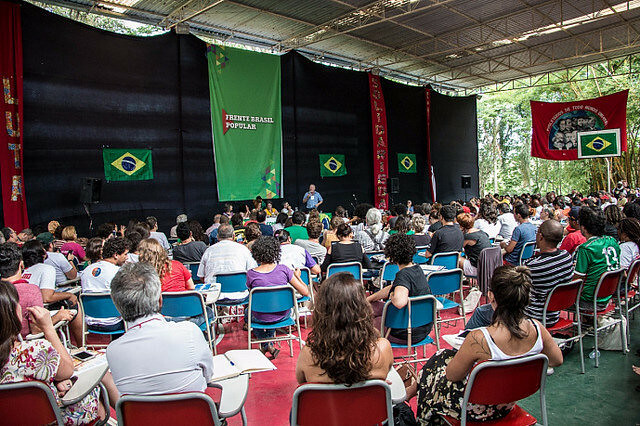 The second national conference of the Brazilian Popular Front, which began on Friday and ended on Sunday, included the participation of various Brazilian social movements – the labor federations, student movements, rural community members, and indigenous leaders among other groups. During the three-day long debate, the participants discussed a wide array of challenges currently facing the Brazilian left including the need to engage people living in the economically marginalized outskirts of the city, known as 'periferias'. At the end, more than 350 militants from various social movements issued a Political Declaration, which advocated for the "construction of a society for the people and by the people."